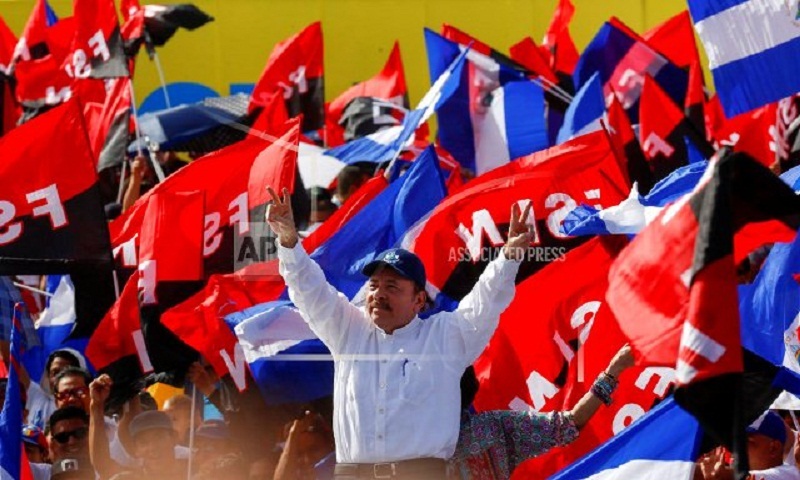 President Daniel Ortega used Thursday's 39th anniversary of the 1979 revolution against dictator Anastasio Somoza to celebrate strengthening his grip on power after three months of anti-government protests and to attack Nicaragua's Roman Catholic Church as allies of "coup mongers." In recent days, the government and its supporters routed some of the remaining focal points of the resistance, reports UNB. Those still loyal to Ortega, who helped lead the Sandinista uprising decades ago, say the country has made progress under his rule. Detractors argue Ortega has become a dictator himself and should step down after consolidating near-total political control in the hands of his family. His wife, Rosario Murillo, occupies the vice presidency. Tens of thousands gathered at a public square near Lake Managua to hear Ortega and others speak during a rally commemorating the fall of the Somoza dictatorship. "It has been a painful battle," Ortega said of the recent unrest. "Painful because we have confronted a conspiracy armed and financed by internal forces we all know and external forces we totally identify." The Nicaraguan Pro-Human Rights Association tallied 351 killings related to unrest between April 19 and July 10, while the government puts the death toll at more than 200. The vast majority of the deaths were civilians, the group said. On Thursday, the Inter-American Commission on Human Rights said it had counted 277 deaths. While lauding his own government for patience and restraint, Ortega singled out the Catholic hierarchy for blistering criticism. He originally asked church leaders to mediate the crisis, but on Thursday he said their actions had disqualified them as mediators. He said the bishops had given him an ultimatum to call early elections and he alleged that churches have been used to stockpile weapons and stage attacks. "I thought they were mediators, but no, they are committed to the coup mongers. They were part of the coup mongers' plan," Ortega said. Managua auxiliary Bishop Silvio Baez said via Twitter that slander does not hurt the church. "It suffers for those who have been murdered, for the families that cry, for the unjustifiably detained and for those who flee repression." Luis Almagro, secretary general of the Organization of American States, which on Wednesday passed a resolution condemning human rights abuses by Nicaraguan security forces, tweeted that all sides must return to the dialogue mediated by Nicaragua's Episcopal Conference. A sea of red and black flags of the ruling Sandinista National Liberation Front spread out before a riser displaying a huge banner proclaiming "Nicaragua wants peace." The backdrop was provided by more than a dozen big "Trees of Life" metal sculptures — a frequent target of protesters in recent months. Hundreds of government supporters wore white T-shirts reading "Pure love for peace." The annual event usually draws hundreds of thousands, including government employees for whom attendance is essentially mandatory. This year, the government did not organize caravans from other cities but instead directed people outside the capital to celebrate locally with piñata parties in parks and plazas. "We are here today celebrating another defeat of all those who do not want peace, who do not want the common good, who do not want these people to get ahead, those of the coup-monger right," said Pablo Bonilla, a Sandinista supporter at the rally. Murillo, first lady and vice president, see-sawed between a combative tone decrying the "perversity of coup-monger terrorism" and promising that Ortega's administration only wants peace. "The revolution is more alive than ever," said Ortega supporter Arelia Membreno, who runs a small business in the Managua neighborhood of Laureles Sur. "They have given me a loan, a scholarship for my daughter, and the street in front of my house has been paved. Before, it was dirt." But Ortega's ability to hand out such largesse has been crippled by the steady collapse of Venezuela, whose leftist government had sold cut-rate fuel to Nicaragua. With Venezuela's economy crumbling and oil production dropping, it has become harder to subsidize Nicaraguan fuel purchases. The opposition Civic Alliance for Justice and Democracy urged Nicaraguans to boycott celebrations. "There is nothing to celebrate," it said in a message circulated on social media, "but rather much to lament." Anti-government protests began in mid-April over cuts to the social security system but broadened to include demands for Ortega to leave office and early elections to be held. Ortega, who returned to power in 2007 following three failed attempts to win the presidency, has sidestepped term limits to get himself re-elected and packed courts and government agencies with allies. His selection of Murillo as vice president was seen by many as a bid to set up a family dynasty. "I never thought I would see Daniel Ortega become a dictator, let alone a criminal who would try to stay in power with fire and bloodshed," said political analyst Julio Lopez Campos, a former guerrilla fighter once close to the president. Apparently eager to celebrate the revolution anniversary without the embarrassment of roadblocks and protest encampments in place for weeks, Nicaraguan security forces and armed civilian groups mounted an aggressive campaign in recent days to clear them by force. Student protesters from the National Autonomous University of Nicaragua in the capital were dislodged, and the symbolically important neighborhood of Monimbo in the city of Masaya was retaken. Monimbo was a stronghold of support for the 1979 revolution, but it has lately been a center of resistance to Ortega.